When I had the good fortune to interview Jon Himoff, CEO of Rezzable, our topics touched on SL™ for perhaps a third of our talk. So it's not really fair to say "Second Life® Education Roundtable" this week. Why Rezzable largely pulled out of SL: "we migrated off of SL b/c SL is too expensive and LL is not as responsive as ne need" (at one time Rezzable had 40 sims in SL). What has been modified for Builderbot: "we modified the code to allow only builders to move content." Rezzable continues to modify the software, but Himoff noted that largely the work they needed from it was done, since they built it "to take content out of our sims to move to OpenSim." What happened to Rezzable's other SL content: It lives on at the Rezzable Grid. What Rezzable intends with Heritage Key: It is Rezzable's main focus now, since "we see multiple-device access to this coming soon. . .as convergence occurs, there will be a gap for new experiences. HK wants to pull all this together; this is where HK sees ourselves as a new media organization." The Academic Credibility of HK: Rezzable hired professional journalists to prepare content, and the company worked with several Egyptologists, including the flamboyant archaeologist Zahi Hawass. Himoff envisions parts of Heritage Key, both their King Tut Virtual Experience and the forthcoming Stonehenge project, working on portable devices. 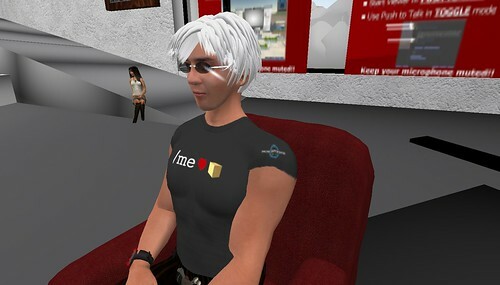 The company envisions a rich set of connections between the 2D Web and 3D "virtual online environments" (a term he prefers to "virtual worlds"). My take on all this: educators are already following Rezzable's example--and were ahead of the firm in many cases--into other virtual worlds and away from the Linden Lab product. For now, it's only a bit of exploring, though Heritage Key is already rich enough in content to be the focus for a class project. thanks for having me and asking such interesting questions. I hope people found it useful.